Author Ron Rothman tells the interesting story of The Harmony Guitar Company in his gorgeous 176-page hardcover book, Harmony - The People's Guitar, 1945 - 1975, published by Schiffer Publishing, Ltd. During those 30 years of production in Chicago, Illinois, the American company "rocked" the world of many professional and amateur guitarists. In addition to the history of Harmony Guitars there are great photographs of the guitars and the guitarists who played them including Keith Richards, Jimmy Page, Pete Townsend, Richie Valens, Dave Davies of the Kinks, John Sebastian, to name but a few. Harmony - The People's Guitar 1945 - 1975, by Ron Rothman makes a great gift for your favorite guitarist or vintage guitar collector. In author Ron Rothman's latest book, Harmony - The People's Guitar, 1945 - 1975 published in 2018 by Schiffer Publishing, Ltd. he takes the reader on a visual odyssey of the world of Harmony guitars. Delving upon his own background as a guitarist and selling guitars at Rothman Department Store in Southold, New York, he deftly brings the history of The Harmony GuitarC ompany to life with wonderful photographs, catalog descriptions, illustrations and interesting anecdotes in the 15 chapters. About the Book: Chapter 1: Harmony - The People's Guitar, Chapter 2: Some Of The Parts ... Of Many Guitars, Chapter 3: Stellas to Sovereigns: Harmony Flat Tops: 1950- 1973, Chapter 4: Harmony Acoustic Archtop Guitars, Chapter 5: Harmony Hollywood And The Spanish Electric Archtop Guitars, Chapter 6: Harmony Stratotone And The Solid Body Electric Guitars, Chapter 7: Harmony Amplifiers: Making The Music Heard, Chapter 8: Rocket To The Stars And The Harmony Professional Guitars, Chapter 9: Rebel With A Cause, Chapter 10: Harmony Bass Guitars: Holding Down The Bottom!, Chapter 11: Harmony Caribbean and Colorama Guitars, And The Different, Unusual, And Not So Popular Guitars, Chapter 12: Roy Smeck: "Wizard Of The Strings, "Chapter 13: Harmony's Folk Instruments, Chapter 14: Harmony Reissues, Chapter 15: Musicians And Their Harmony Guitars. From the book's title, Harmony - The People's Guitar 1945 - 1975, one might conclude that it only focuses only on that specific period, however it goes well beyond that, introducing the history of the company and noting that The Harmony Guitar Company was established in 1892 and at one time was the largest manufacturer of student guitars. In addition to acoustic and electric guitars, they also made amplifiers, banjoes, ukuleles, and mandolins. The well-written book has gorgeous photographs, great descriptions of the products, and wonderful illustrations. As the company once claimed, "where's there's music ... there's HARMONY," and thanks to Ron Rothman, their legacy lives on, as does the music. 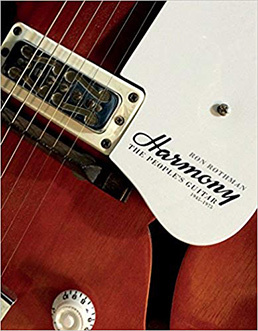 Harmony- The People's Guitar, 1945 - 1975 by Ron Rothman is published by Schiffer Publishing, Ltd. and is available as a hardcover and as an eBook. ISBN: 978-0-7643-5520-2, $34.99. The book is available in bookstores and online, including: Schiffer Books, Amazon, and Strand. © October 2018.Luxury Experience. www.LuxuryExperience.com. All rights reserved.